Yep, Apple wasn't always a global behemoth. 27 June 1997 marked the last day in the worst financial quarter in Apple history, in which Apple lost $56 million — effectively bringing an end to then-CEO Gil Amelio’s 500 days running the company. The $56 million loss contributed to an overall Apple loss of $1.6 billion during Amelio’s reign: effectively wiping out every cent of profit Cupertino had earned since fiscal 1991. In other words — ouch! Despite this, Amelio’s mid-1990s rise to the top at Apple was initially greeted warmly, since he rejected a buyout offer by Sun Microsystems and announced that he was going to go ahead with what many, many people thought was the most sensible move Apple could’ve made at the time: licensing out Mac OS to third party vendors. Unfortunately, this triggered the arrival of a large number of low-cost Macintosh clones, which eroded Apple’s own share of the market, while doing very little to address the fact that Apple’s operating system at the time was incredibly dated — particularly given how much ground had been lost to Microsoft and its astonishingly successful Windows 95. The net result was Apple announcing the firing of 3,000 people and, based on Apple’s $56 million quarterly loss in 1997, Amelio stepping down as CEO. Of course, as we now know in retrospect, today’s historic event marked the beginning of Apple’s turnaround. Despite Apple being less than 90 days from bankruptcy when Steve Jobs took over as interim CEO in 1997, the following spring he appeared at MacWorld and revealed that Apple had turned a corner, with a $45 million profitable quarter. 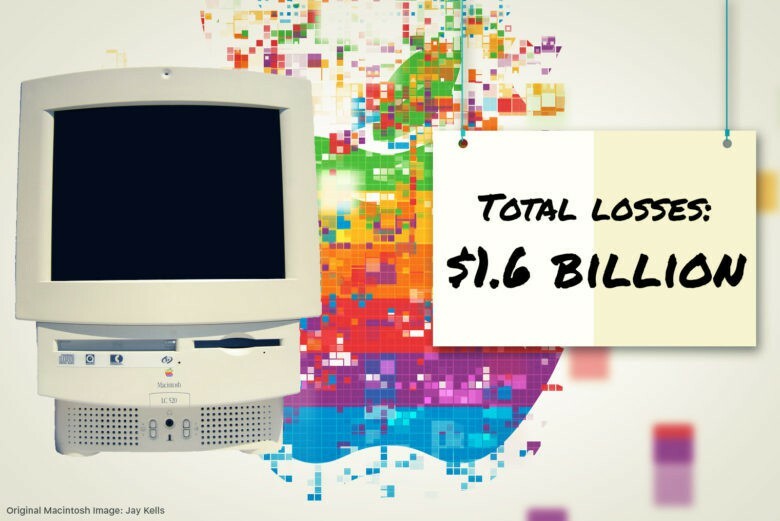 In fiscal 1998, Apple earned an impressive $309 million. And all of us kicked ourselves for not remortgaging the house to buy all the AAPL stock we could afford!